Trichogramma minutum are parasites native to eastern parts of the United States and are used in similar settings as T. platneri: orchards, landscaping and vineyards. Moth eggs less than four days old are preferable for T. minutum, so time releases with when adult moths are actively flying and laying eggs. Trichogramma platneri is native to the western parts of the United States and is commonly used in orchards, in vineyards and landscaping for preventative control of various caterpillars and borer larvae. T. platneri are effective in many of the same environments that T. minutum which is native to the eastern U.S. Moth eggs less than four days old are preferable for T. platneri, so time releases with when adult moths are actively flying and laying eggs. Trichogramma brassicae is especially useful for controlling moth populations on cole crops. Use T. brassicae in cooler climates with low-lying plants affected by caterpillar and/or borer damage. IDENTIFICATION: Adult wasps are 1/50", yellow or yellow and black with bright red eyes, short antennae, and compact bodies. They look like gnats. A small hole in the host egg is visible if the wasps have emerged. HABITAT: Moth eggs. Parasitized eggs turn black. European corn borer, corn earworm, imported cabbageworm, diamond back moth, cabbage looper, pecan nut casebearer, tomato hornworm, and tobacco hornworm. FEEDING HABITS: Little is known about the feeding habits of the adult wasps. NATURAL CONTROL: These parasitoids are reared and shipped as larvae or pupae within the eggs of an alternate host. ORGANIC CONTROL: None needed - highly beneficial. INSIGHT: Man-made pesticides are the most destructive force limiting these helpful wasps. Trichogramma wasps are purchased on 1" tabs containing about 3,300 moths' eggs that contain wasp pupae. The adult wasps emerge from the eggs to parasitize troublesome insect eggs. Use a minimum of 10,000 eggs per acre on residential site per release. They can be stored for a week or less at 42°F. COMMERCIAL PRODUCT INFORMATION AND USE: Moth eggs that contain trichogramma eggs are glued to the black strips or small cards. On the strips there are holes punched at each end of the strip and perforations in the middle of the strips so that it may easily be torn into two pieces. There will also be loose black or gray eggs inside the bag but they will not move. There are enough trichogramma eggs on one strip to treat 25 pecan trees. This will vary from brand to brand. Under good lighting, watch to see if there is movement in the bag. When the Trichogramma start to hatch you will see tiny insects moving inside the bag. Remember the loose eggs will not move. A magnifying glass is needed to be sure you are seeing movement. 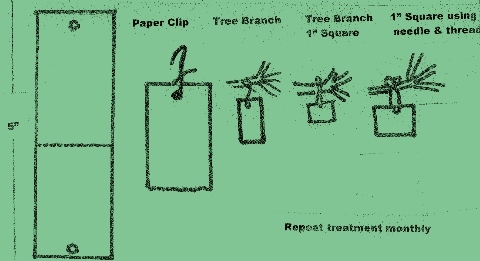 A wire or paper clip or needle and heavy thread are needed to attach the strip (or a 1-inch piece of the strip) to the tree. At dusk or at night, take the unopened bag outside to the trees on which you wish to place the Trichogramma. If you have more than five pecan (or other) trees in your yard, cut the strip into five one-inch pieces. Hang these pieces in the trees on the south side of the tree (so the wind will blow the trichogramma into the tree). Pierce the strip with one end of the paper clip. Do not slide it over the paper because you will knock off trichogramma eggs. The strips can be cut into five one-inch pieces if you desire. The strips or small cards can also be put in containers with holes punched in the lids. Place in shady locations to prevent excessive heat. The tiny wasps normally hatch in 24-48 hours. Trichogramma wasps can be released from small containers or cards attached to plants that are having problems with pecan casebearers, cabbage worms, tomato hornworms, corn earworms, armyworms, and many orchard pests. These beneficial insects are tiny gnatlike parasitic wasps. They should be released in a succession of releases, starting in the spring when affected plants first leaf out. Repeat the release every two weeks. Once established, these beneficials don't necessarily need to be released every year. In an organic program the gnatlike wasps will establish natural populations and be around every year to help control pest insects. Various worms, the larvae of moths and butterflies, eat the buds, leaves and flowers of many different species of food crops and ornamental plants. They can be sprayed and killed with Bt (Bacillus thuringiensis) products, spinosad products or orange oil-based products. For better effect from the killing sprays, add one ounce of molasses per gallon of spray. Although Bt is an acceptable biological product, it will kill butterflies as well as the larvae of moths and should only be used as a last resort and on plants where caterpillar feeding is in progress. When used, it should be sprayed at dusk. The better approach is to release trichogramma wasps as a preventative. They can be purchased at organic garden centers, feed stores and ordered by mail. The 1” cards contain about 3000 moth eggs. Larger strips have more wasps. Simply pin the cards or strips on tree trunks or on fences. The almost microscopic wasps emerge from the sandpaper looking moth eggs and fly off to parasitize and destroy other pest eggs. Nothing works better for the control of canker worms, greenworms, loopers, armyworms, pecan casebearers, tent caterpillars, webworms and other vegetarian worms. Trichogramma wasps must be put out before the pests hatch and start eating. If the wasps are dead or have been eaten by fire ants, they won’t work. Buy from reputable dealers and control the fire ants with organic techniques. Vaseline put on the nail or pin used to mount the cards or strips will prevent any existing fire ants from getting to the eggs. They will eat them like jelly beans if present and have access. ANSWER: Apply Vaseline to the pin or nail. The ants won't be able to crawl across to the eggs. One of the most important parts of a successful trichogramma release is to control the fire ants. Most organic gardeners don't usually have a problem with them, but outbreaks can be handled with orange oil drenches, beneficial nematodes, spinosad and/or dry molasses.